I love this time of year when the garden is really coming alive. I want to share with you some of my "easy" "frugal" gardening techniques. It all actually starts in the Fall, when it's leaf raking time. 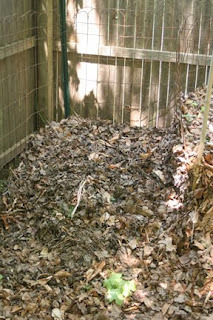 When I rake the leaves I store them in a caged bin in the back corner of my yard. I"m always amazed at how many leaves I can store there. I always have to dump the leaves, then climb up on the pile and stomp them down, but that's actually fun, it's so springy and bouncy. 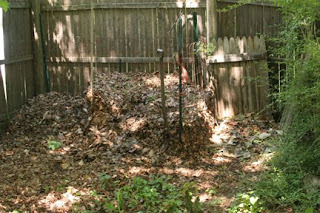 My leaf bin is about 4'x4' and the pile probably gets up to 4 or 5 feet tall. 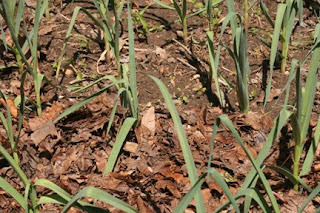 At that same time of year it's also time to plant next year's garlic, so I prepare the planting bed with compost that's been breaking down all summer, then plant the cloves of garlic. 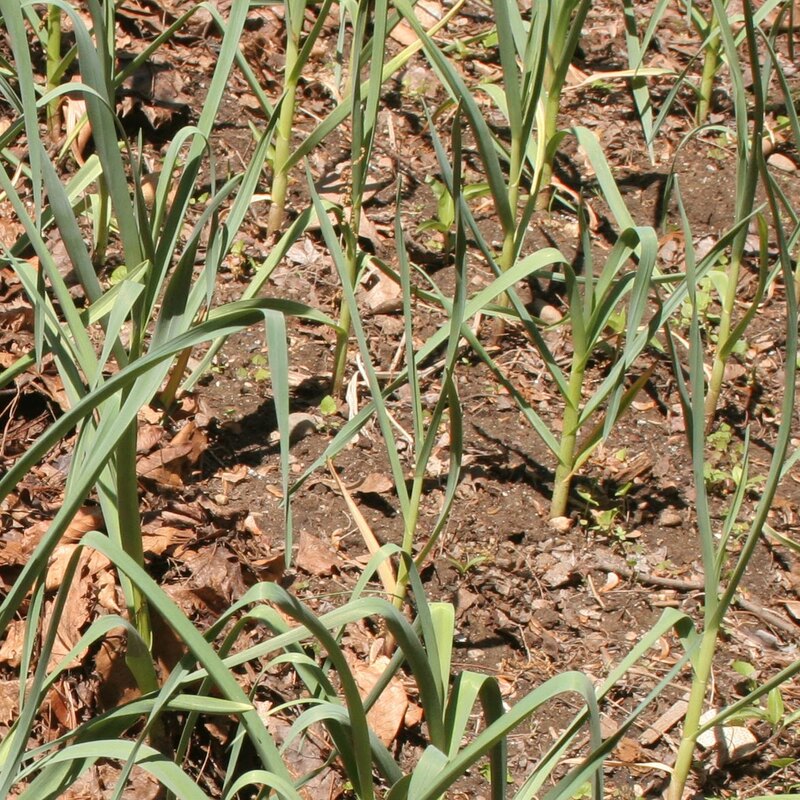 Fast forward to the time of year we are now in, gorgeous May weather, when the garlic is up and growing. 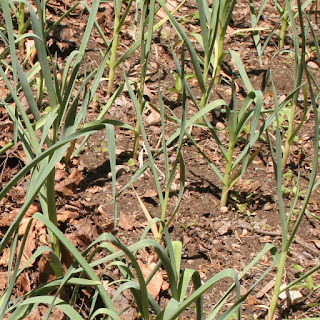 See the green stalks of the garlic, and among them, little weeds starting to happily sprout up, too? Years ago I read a book, an old one, called "How To Have a Green Thumb Without an Aching Back". 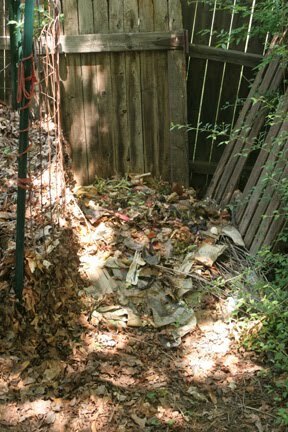 The author's premise was that if you mulch thickly, you won't have to spend hours weeding. Here's where those leaves I raked last fall come in. I tuck them around all of the plants growing in my garden. Here's where I finished yesterday when the thunderstorm rolled in. I got most of the bed covered. 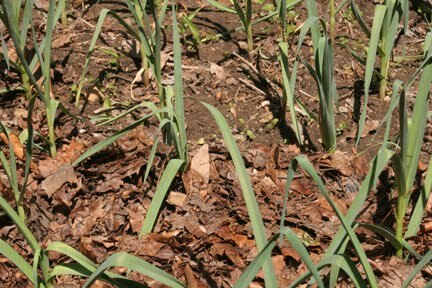 There are a lot of benefits: almost no weeding (any weeds that are able to pop through the mulch are very easy to pull out); I need to do much less watering, as the leaves keep moisture in; it's much easier to rake and dump the leaves in the bin than to bag them and have them sit out front for weeks, waiting for the town to come pick them up; and it's all free fertilizer. I also use the leaves for my flower beds and as food for the compost heap. 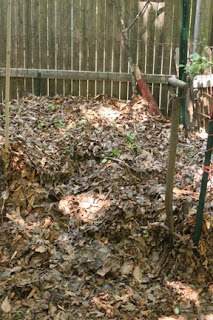 This is my composting area. It's a spot about 10 feet long by 4 feet deep in the back corner of my yard. I used all salvaged materials to cage it in, except for the fence posts I bought at the hardware store. There are 3 sections. This one is on the far left, and it's the compost that's been working since last fall. I'll empty it onto my garden beds within the next month. This section is on the far right. It's the raw bin (not pretty). All of my kitchen scraps get tossed here all winter, as well as my bunny's poo and bedding. When I empty the finished compost bin on the left, I will layer this stuff with leaves from the leaf bin (the middle section) into the bin on the left and it will cook all summer. 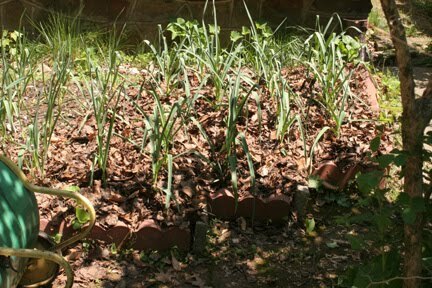 Come fall, I will put it on the garlic bed and begin a new pile with all the plants that get pulled out of the veggie garden. And the cycle will begin again. It makes so much more sense to use what is mine for free (all those leaves and kitchen scraps) than to have the town truck it away, and then have to pay for fertilizer!